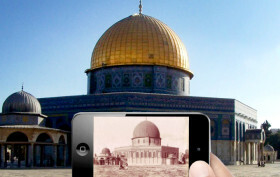 We’ve taken a look at a couple of fascinating websites that let users tour their city’s history through historic photos or overlaid maps from 1600 to present day, but a new app is trying to reach a similar goal on your mobile phone in real time. Pivot is an augmented reality app that alerts users when they’re near a “pivot point,” at which time they can raise their phones and see pictures and videos of what that exact location looked like in the past. The app’s creators hope this will become a historical preservation platform.